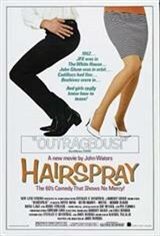 Forever interested in the kitsch built into past eras, director John Waters chooses the TV dance show craze of the early '60s for his playful focus in Hairspray. Ricki Lake plays Tracy Turnblad, just one of several alliteratively named characters coming of age in 1962 Baltimore, where The Corny Collins Show is the most popular American Bandstand-type program, watched by hundreds of young dreamers each day after school. Being chosen to dance on it is the ultimate status symbol and every young girl's dream, and Tracy improbably wins a featured spot when she infiltrates a dance contest and makes a better impression than her favored rival, the catty Amber von Tussle (Colleen Fitzpatrick). Always able to have fun, even when she's being mocked by the jealous popular girls, Tracy wins the affections of Amber's boyfriend and soon begins leading a movement to integrate the dance show, which has previously featured blacks only in a once-weekly theme night. She is arrested following a demonstration at a local theme park owned by Amber's father (Sonny Bono), who subscribes to the same theory of race relations as The Corny Collins Show. Tracy's adventures are also filtered through her loving but eccentric parents (Divine and Jerry Stiller) and involve a humorous cultural clash with pot-smoking beatniks (Ric Ocasek and Pia Zadora).